Hearts have been the symbol of love since time immemorial and are a regular feature on any item declaring emotions of love, devotion and unconditional affection. This dreamy ketubah plays around with swirls reminiscent of Roman art and architecture in symmetrical patterns. A motif of a white heart with an intricate inner design is quickly obvious over the background details. This ketubah is perfect for couples who, like the Romans, place love over all other factors in their choice to get married. They are passionate about their relationship and have a deep relationship with each other. Blue is the color of the sky and sea, and often represents depth, trust, and loyalty in a relationship. 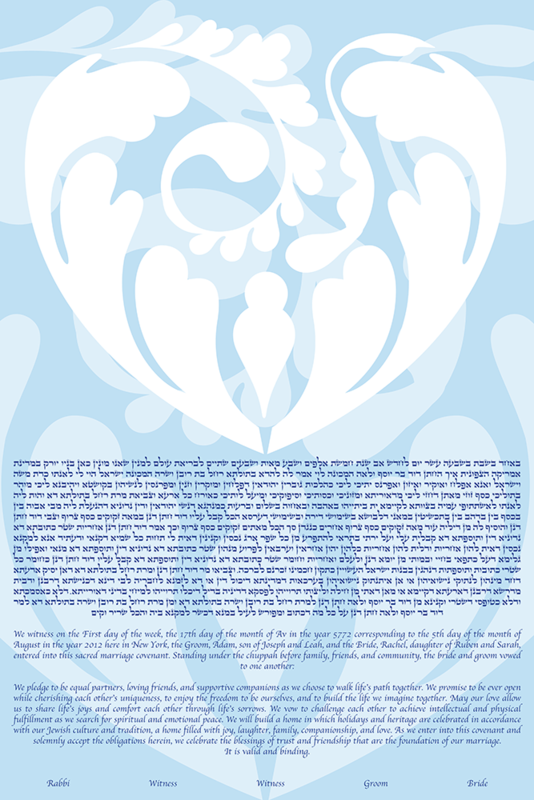 The Blue Heart Mark Ketubah is part of the Heart Mark Ketubah Series of Ketubah. Please see the series page to see the same ketubah in different colours.